It's been over 20 years since the Rainbow District School Board built a new school in the community of Valley East, but in September 2007 over 500 students will walk into a new French Immersion School which is being built on the site of the current Valley View Public School on Valley View Road in Val Caron. 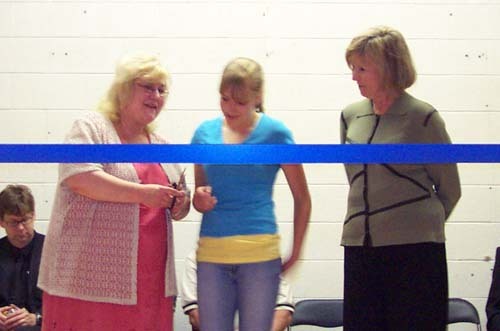 On the last day of school, June 29, 2006, officials from the school board attended a ribbon cutting ceremony to launch the construction project. Shown in the photo above is Sara Fowler, a young girl from Grade 8 who was chosen by Principal Paul Dupont to represent the student body. As Sara cut the ribbon, Board Chair Dena Morrison on the left, and Board Director, Jean Hanson watched. "The construction of a new school will have a positive impact on learning and will benefit students in the area over the long term," said Morrison. "The age of the existing schools, coupled with the large amount of capital required to renew the facilities, made building new the best option for this expanding community." In a public press release, it was pointed out that the new school will be barrier-free and have space for lower class sizes in the primary grades as well as physical education, instrumental music, visual arts, computer technology, a library and special education. There will also be space for a before and after school program and a full daycare in response to community needs. The school has the potential to be an early learning and care hub for Valley East. In addition, the playground area will have zoned environments to accommodate various age groups. The new school will offer programs in French Immersion from JK to Grade 8. Projected enrolment for September 2007 is just under 500 students. Val Caron Public School will close in June 2007. The Rainbow District School Board is the largest school board in Northern Ontario with 16,000 students in 40 elementary and 9 secondary schools in Sudbury, Espanola and Manitoulin. The 328 Grades 2 to 8 students from Valley View Public School rose to sing their school song, while the 166 JK to Grade 1 students from Val Caron Public School sat on the floor and listened during the special ribbon-cutting ceremony which was held at Valley View Public School on June 29, 2006. (see the story above). The students assembled in the Valley View Public School gymnasium for the event. The current state of the two schools made it necessary for the Rainbow District School Board to decide it was time to build their first new school in Valley East in over 20 years. 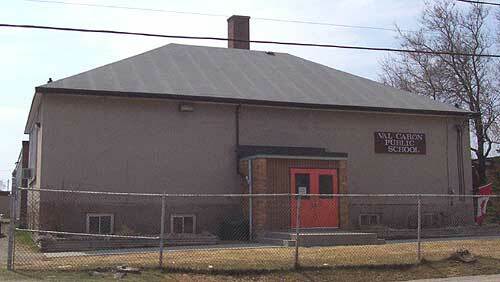 Val Caron Public School was built in 1940. The building has a capacity for 141 students, but there are currently 166 students enrolled in the school. Enrolment has been predicted to exceed 156 students by the 2009-2010 school year. It has a portable gym and the former gym space is now being used as a classroom. There is no space for a library, special education resource room, computer lab or in-class washroom facilities for Junior and Senior Kindergarten students. There is no space to implement smaller class sizes in the primary grades and there is no space to consider a day care or any other form of community use. The property does not allow for expansion and maintenance costs at the school are estimated to exceed $500,000 over the next five years. 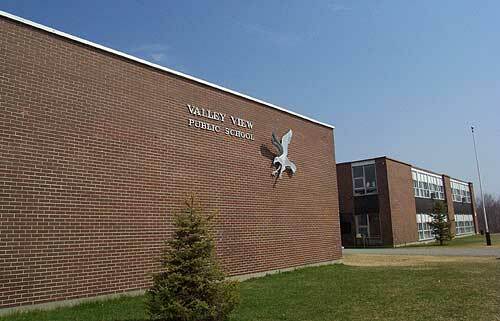 Valley View Public School was built in 1961. The building is rated for 305 students, but there are currently 328 students at the school. Enrolment has been projected to exceed 350 students by the 2009-2010 school year. There is no library at the school or space for a special education resource room, instrumental music and visual arts program or computer lab. The current gym is not ideal and there is no space to implement smaller class sizes in the primary grades. The current building is not accessible. There is no space for a day care or for community use. There is room for expansion on the current site of Valley View Public School and maintenance costs at the school were expected to be close to $2 million over the next five years. After taking into account all of the above information, the Rainbow District School Board decided it would be best to construct a brand new, $15 million state-of-the art facility on the existing site of Valley View Public School. Based on the anticipated growth of the community of Valley East, it was likely a decision that couldn't be put off any longer. Each of the other three school boards have all completed major capital expansion projects within the past five years in this community. 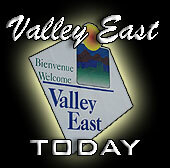 All You Have To Do Is Register To Receive Valley East Today Every Tuesday! Would you like to have a chance to win millions of dollars? Would you like to have a chance to win valuable other prize packages from area merchants? Well you can have that chance right now, and all you have to do is help spread the message that Valley East is a great place to live! 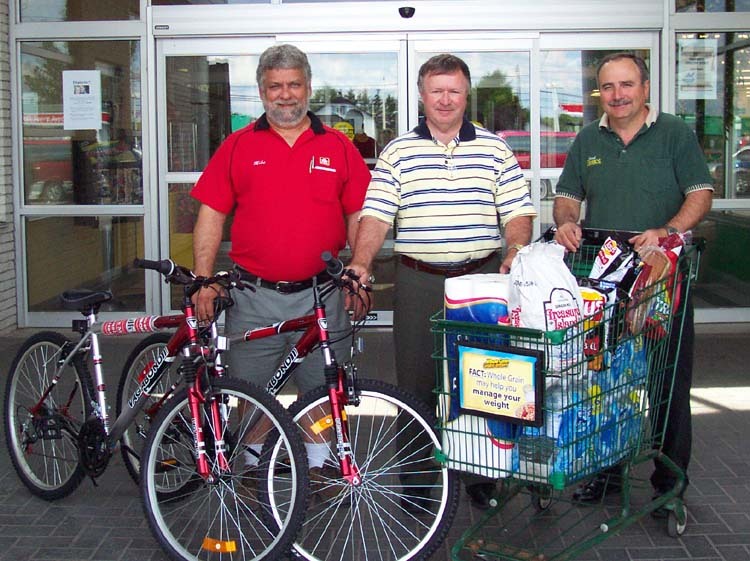 Runners up will receive other valuable prizes, including “two” mountain bikes donated by Hanmer Home Hardware, $300 in groceries from Desjardins’ Food Basics, plus more prizes from other local merchants which will be announced in the coming weeks! 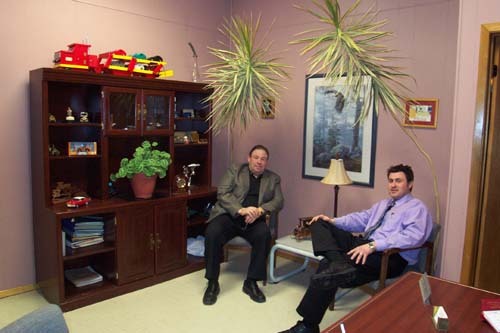 When you ask Jeff Masciangelo, shown on the right in the photo, how he likes his job as a "Used Car Salesman", he very quickly points out that he has never been a "used car salesman" and has never once considered himself as a salesman. "I don't have the personality to be a 'salesman'," Jeff commented. "I am not a hustler, and I could never sell a car to a person just so that I could make a bigger commission." What Jeff, and his father, Ron, shown on the left in the photo, have become through Masciangelo Motors, are Independent Vehicle Agents for a growing number of clients who seek their services whenever they are looking for a pre-owned vehicle. Whenever a person visits Masciangelo Motors for the first time, they are immediately impressed by the process that is followed by Jeff and Ron. Certainly, Jeff and Ron will take you on a tour of the show room and the lot to give you an idea of the kinds of vehicles they have on site, but what they really want to do is discuss your particular situation and the kind of car or truck that you need. Once they know the type of vehicle that will suit those needs, and they get an idea of the kind of money you are willing to spend, Jeff and Ron then go to work finding you a vehicle that will meet, or most often, exceed your expectations. Masciangelo Motors belongs to the Online Vehicle Exchange. This is a web site that allows them to take part in "live auctions" that are going on all over North America. 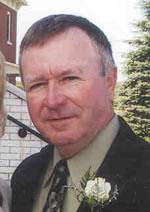 For example, in the photo above, Jeff is logging on to the Online Vehicle Exchange Home Page where he can see all of the auctions that are scheduled for any particular day. He can see which ones are being "simulcast live" and can log on and take part in the auction right from his office. He can "bid" on cars and trucks just as if he was right there at the auction. This means that he can "search" for a vehicle that will match your needs. Usually he will find dozens, if not hundreds of matches that have been registered for auctions. Careful investigation of the list will then allow him to determine which of the matches will be the best buys, and then he usually has one of two choices. Part of the web site contains a 'Dealer Exchange' that runs much the same as E-Bay. Vehicles are put on the site for a total of 14 days and dealers have an opportunity to place their bids. At the end of the 14 day period, the dealer with the highest bid gets the vehicle. However, in some cases, the "Buy Now" price is reasonable and if the vehicle is exactly what Jeff or Ron are looking for, they will make an immediate purchase and have the vehicle delivered right away. "There are great deals out there if you are willing to take the time to search for them," explained Jeff. "We only buy late model, low mileage vehicles. That way we know that our customer will be satisfied and will turn into a long-lasting 'client' who will return to us for service whenever they need a car or truck. We don't just want to make a single-sale. We want to develop a lasting relationship. "We like to purchase our everyday cars and trucks from Ontario," added Jeff. "There are so many vehicles being auctioned off every week in Ontario that we can usually find any kind of vehicle you are looking for. The advantage of buying in Ontario is that we can get your vehicle delivered within four days or less"
Jeff explained, "We usually purchase our Classic Cars and Specialty Vehicles from the United States, so it takes a lot longer to get them here, but it's always worth the wait." Whenever Jeff or Ron purchase a vehicle over the internet, they pay an extra surcharge to get something called a "Manheim Guarantee". This is like having your own mechanic at the auction. A complete inspection and subsequent report is provided to the dealer who then has 48 hours after delivery to return the vehicle without obligation or charge if there are any surprises. Ron Masciangelo is still from the old school when it comes to buying vehicles, so whenever possible he will go to the auction himself if he knows there are vehicles that he is looking for. This allows him to see the car or truck himself, but it also allows him to save on delivery and stocking fees if he can drive them back instead of having to hire the auction company to deliver the vehicles. Nevertheless, Ron is absolutely amazed at how the internet has made it so easy to come up with fantastic deals for his "clients" that would in the past been extremely difficult to find. If you are in the market for another vehicle, Ron and Jeff invite you to stop in and talk to them. They won't try to sell you a car. But they will try to find out what you are looking for and help you decide what kind and type of vehicle will be best for your needs. They will then determine exactly what you feel you can afford to spend on a vehicle and will find you several options that may surprise you. "We've had people come in to see us who were convinced that they wanted to buy a new car or truck. When they see what we can come up with for the same amount of money that they were willing to spend on a new vehicle, many change their mind. You can usually be driving a much better quality two or three year old vehicle with low mileage and plenty of options that will give you much more satisfaction that a newer, less expensive vehicle," concluded Jeff. "Just come in and talk to us. It certainly won't hurt, and like I said before, I am not a hustler, so don't expect me to try to sell you a car or truck that I know isn't good for you just to make a sale. We will only sell you a vehicle from Masciangelo Motors if both of us are going to be happy with the results. That is our promise."